IndiaMART InterMESH Ltd, which runs an online B2B platform for small and medium businesses connecting global buyers with suppliers under the brand Indiamart, has raised an undisclosed amount in Series C funding led by Amadeus Capital. WestBridge Capital, Accion Frontier Inclusion Fund (managed by Quona Capital) in addition to existing investor Intel Capital, participated in the funding round. The capital raised will be used to further power its B2B business by scaling up Indiamart.com along with Tolexo.com, the online marketplace for businesses it launched in 2014, it said in a statement. "The Indian B2B sector itself is set to grow by 2.5 times and touch $700 billion by 2020. Given the socio-political and environmental forces in the country, we foresee larger strides being taken by MSMEs in the coming years," Dinesh Agarwal, founder and CEO of IndiaMART said. VCCircle had earlier reported that Indiamart had initiated talks to raise as much as $200 million for Tolexo Online Pvt Ltd.
IndiaMART has put in an initial capital of around Rs 100 crore to build Tolexo. Tolexo competes with other B2B focused e-com sites such as Industrybuying.com. Indiamart co-founder Brijesh Agrawal is the CEO of the firm. Early last year, the company roped in Harsh Kundra as co-founder and head of product and technology. It also counts Navneet Rai, co-founder, Inkfruit.com (merged with private label fashion e-tailer Zovi.com back in 2013), as a co-founder. Backed by Intel Capital and Bennett, Coleman & Company Ltd (BCCL), IndiaMART offers products that enable SMBs to generate business leads and use business information (finance, news, trade shows, and tenders, etc.). Indiamart was founded by Dinesh Chandra Agarwal and Brijesh Agrawal in 1996. IndiaMART was styled on the lines of China's Alibaba. However, while Alibaba ventured into B2B and B2C online commerce space and scaled up to become the world's largest online seller, IndiaMART confined itself to matching buyers and sellers. 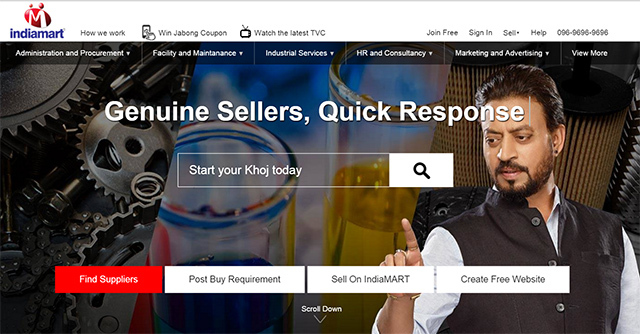 Indiamart claims that its platform enables over 24 million buyers to search from over 30 million products and get connected with over 2.1 million suppliers. This is the first investment in an Indian company by UK-based technology venture capital firm Amadeus Capital Partners, which had entered the Indian market early last year. The venture capital firm, with some £500 million of assets under management, had appointed Bhavani Rana, who was the investment director at Intel Capital, as a partner to lead the team in India. Founded in 1997, Amadeus Capital Partners has made more than 90 investments in industries ranging from communications and networking and software, to e-commerce from 10 funds totaling over $1 billion in cumulative commitments. The firm, which was co-founded by Hermann Hauser, has a presence across the US, Sweden, South Africa, Brazil and now India. "The investment fits Amadeus' strategy of backing entrepreneurs benefiting from increased penetration of digital technology in emerging markets. Through its subsidiary Tolexo, IndiaMART is able to utilise data to help consummate transactions within the platform," Rana said. Amadeus Capital Partners Ltd. Indiamart Intermesh Ltd. WestBridge Capital India Advisors Pvt. Ltd.